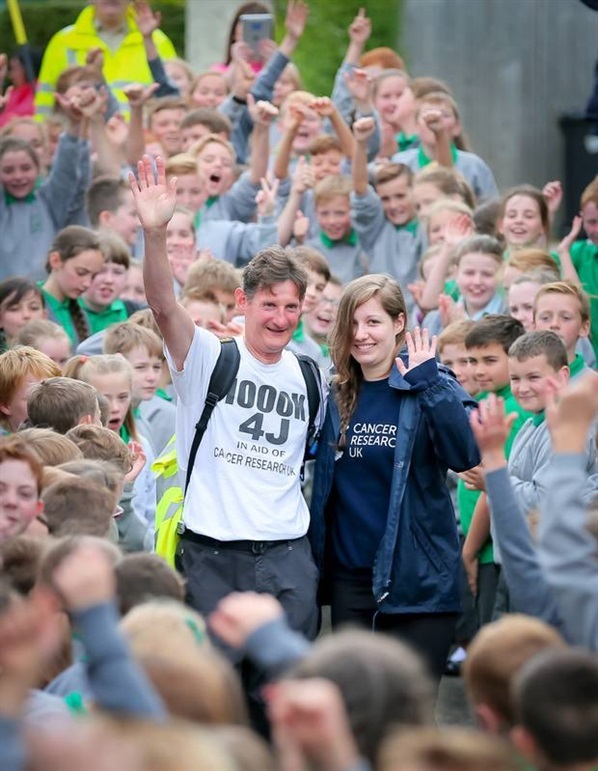 At the start of September, having pledged to walk the entire Ulster Way in memory of his wife Jacqui, Dermot Breen completed his long distance walking challenge raising thousands of pounds for Cancer Research UK along the way . 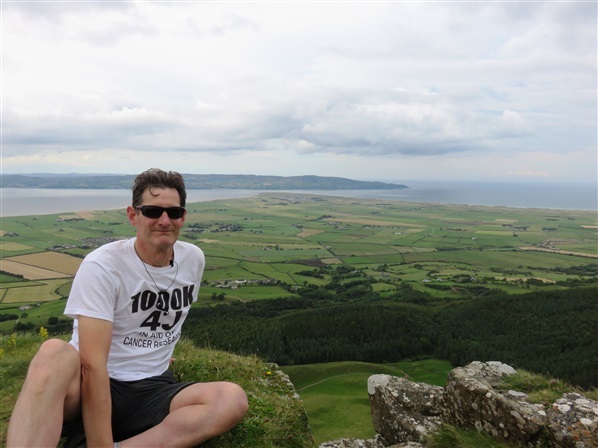 Inspired by the book ‘The Unlikely Pilgrimage of Harold Fry’ (a firm favourite of the couples), in which the title character walks 627 miles to visit a terminally ill colleague Dermot pledged to walk even further (and did so covering a distance of 652 miles!) 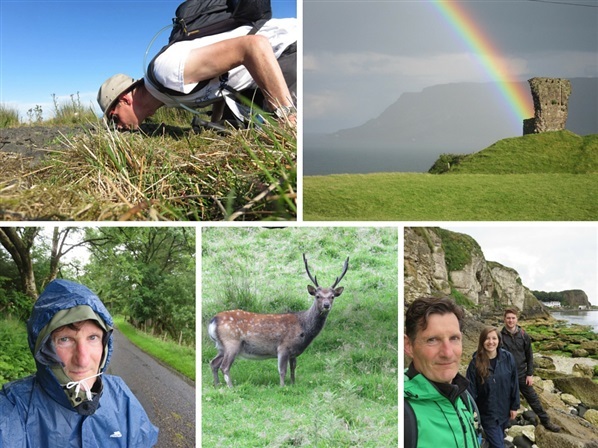 Inspired by his story, we recently caught up with Dermot to chat about his experiences along the Ulster Way. Previous to your challenge, had you much walking experience? Absolutely none, apart from the odd short casual walk for a mile or two along a beach or through a park, usually with my wife Jacqui. Invariably I would be the first one to say "Right, that's far enough; time to turn back now". I suppose that's what made doing this walk such a challenge. I was taking on something entirely new and I had no idea how I would cope with over 625 miles. Did you have any expectations going into the challenge? Were these met? Not so much expectations as I didn't really know what to expect; more hopes. I hoped that I was going to be able to complete the challenge within the schedule I had set for myself and I also hoped that I was going to raise lots of funds for Cancer Research UK. Thankfully both of these hopes were met. I finished the walk on 4th September as planned and I managed to raise over £12,000 for Cancer Research UK. Did you do much preparation / planning? If so, what? To be honest, plenty of planning, but not enough preparation. I had it all worked out in great detail on paper, knowing how far I would walk each day, where my set down and pick up points were, where I would be staying overnight, possible eating places, etc. The WalkNI website was invaluable for this planning, particularly the descriptions of the routes and the printable maps. However, my physical preparation left a lot to be desired. I guess I was so keen to get started that I didn’t really give my feet and legs a chance to properly adapt over sufficient time. My first “training” walk turned out to be a 24 mile hike from Belfast to Lisburn and back in a pair of casual boots. Absolute madness and not to be recommended. My feet were ruined and my legs ached for days afterwards - I still have one blackened toenail remaining from that experience! Then after the first few days of my walk, I had to stop and rest up for a couple of weeks when I developed a painful case of shin splints. Not a great start to my challenge! What kit did you bring on your walk? What could you not have done without? The fact that I was normally being left off and picked up by car each day, meant that I was able to keep my kit to an absolute minimum. I thankfully had no need to carry a tent and generally didn’t need to worry about overnight provisions. I routinely packed a waterproof jacket and leggings – essential for the NI climate - and also a waterproof cape that was large enough to cover me and my backpack when required. I learned early on during my short training period that good lightweight and waterproof hiking boots/shoes and good quality socks were essential – I had boots for the hills and rough terrain and a pair of good walking shoes for the roads and other flat sections. Maps, route descriptions, plasters, compass, mobile phone, iPod and plenty of snack bars were also carried as was a packed lunch if there was not going to be anywhere to stop off on route, which was normally the case. I also took a pair of walking poles with me when I knew I would be tackling boggy ground and/or steep slopes and these proved invaluable. However, the thing I could not have done without was not actually an essential in the normal sense, and that was my camera. It was important for me right from the start to keep a record of my journey and to be able to provide my Facebook followers with a visual account of my challenge. I took over 6,000 photos during the 38 days of my walk. Needless to say, not all of these were worth showing but I like to think that there was the odd decent one among them! How did you find the navigation of the route? Generally this was straightforward enough as a lot of the route is well signed and way-marked and I also carried maps and route descriptions downloaded from the WalkNI website for each of the sections. I would advise against depending on any one of these on their own though. I really needed to use them all in combination and even then there were a few occasions when I inadvertently went off route for a bit before realising and having to double back or take an alternate route to meet up with the Way again. There are certainly a few sections where the way-markers could be better and I did discover a few inaccuracies in some of the maps (which have since been corrected). I did carry a compass, but only needed to use it a couple of times and even then it was more for reassurance than for actual navigation. However, I would imagine that in certain weather conditions a compass could be essential. If you could choose to go back and walk any section again, which would it be? This is a hard one as there were so many wonderful sections along the Ulster Way. However, if I was to choose one it would have to be the Causeway Coast Way section and particularly the section from Portrush East Strand to Carrick-a-rede. There are just so many stunning sights to see along this section including Whiterocks, Dunluce Castle, Runkerry, the Giant’s Causeway, Whitepark Bay and Ballintoy. On a good day it is just impossible to beat in my estimation. What was your favourite view? I am going to cheat here and give two. First was the fantastic view from the summit of Benbradagh, which actually requires a short detour from the official route, but it is definitely worth it. The second is the breath taking view from Binevenagh. The view from here on a clear day is simply stunning, overlooking the River Roe and Lough Foyle to the West, Magilligan Point and Inishowen to the North and Gortmore and Benone to the East. If I was forced to narrow my choice down to one, it would have to be Binevenagh. 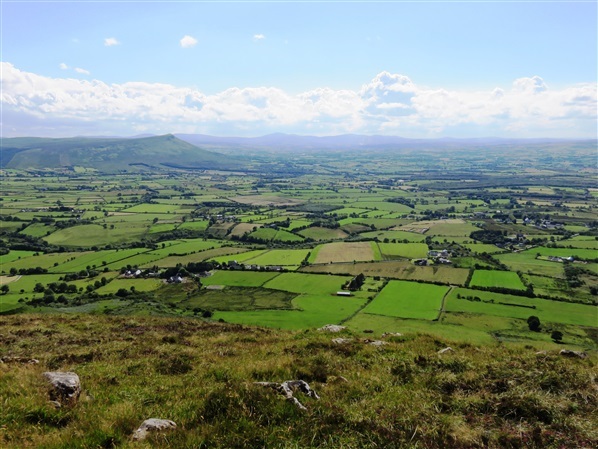 However, I am conscious of the fact that some other potentially superb views were denied to me due to poor weather, such as the views from Slieve Gullion summit, the Magho Cliffs and Cuilcagh Mountain. What was your most challenging moment / lowest point whilst walking and how did you overcome it? I don't have to think very hard about this one. Donald’s Hill, in the Sperrins north of Dungiven, and the subsequent trek across the blanket bog and heather to Rigged Hill, was, without a shadow of a doubt, the most challenging and exhausting section of the Ulster Way that I encountered. The climb up the steep slope of Donald’s Hill was tough in itself. However, what followed made the climb up Donald’s Hill seem like a walk in the park! Bog hell awaited. The absence of way-markers here meant that I had to simply head in the direction of the radio masts and wind turbines in the distance and pick my way through the very rough bogland as best I could. There were plenty of stumbles and falls along the way, accompanied by even more sweat and curses, and for a long time the masts or turbines just didn’t seem to be getting any closer. I have never been so happy to finally reach a proper hard track roadway. Undoubtedly, it was the thought of why I was undertaking the challenge in the first place that kept me going. That and the thought of the bottles of cold beer that were waiting for me in the fridge when I got back home! If you had to single out one memory from your walk that you could revisit, what would it be? There are so many to choose from, but I suppose the one that replays in my mind the most is the final day of the walk and my return to Greenisland Primary School, where I had set off from two and a half months beforehand. I had chosen this as my starting/finishing point as it was the school where Jacqui had taught for 25 years. My daughter, Hannah, and her boyfriend, Jonny, were walking with me from the starting point that day in Ballynure and I was joined by a lot of friends and colleagues along the way, which was fantastic. The welcome back I received from the staff and children at the school was just incredible. It all made for a very heady mix of elation and emotion and I don't think I will ever forget it for as long as I live. It was a truly fitting end to what was, for me, a very personal challenge. Any interesting stories/memorable people from along the way? Again, there were so many. There were interesting animal encounters, including a deafening donkey demanding attention, a wandering dog that stopped and rolled over in front of me to have its tummy rubbed, a curious seal watching silently from the water and a large brown cow on the road that caused me to unhitch one of my walking poles just in case! In relation to people, I had tremendous support from family and friends along the way, helping out with a bed for the night, packed lunches, lifts to starting points and from finish points and even walking sections with me. The kindness of strangers that I met along the way was also memorable, from people that offered lifts in the rain (which obviously I had to decline), to people that helped with directions and even handed me donations when they found out why I was doing the walk. Particularly memorable were the two young teenagers, Oscar and Rowan, who I met at a church in Coleraine one Sunday morning where I had stopped to use the toilet facilities. They had been asking a friend about my walk and when I came out they insisted on giving me a donation - one of a number of spontaneous acts of kindness that I witnessed during my challenge. Some sections you had company but the majority of the miles where spent walking alone. Did you listen to any music along the way – if so what was on your playlist? I liked to enjoy the sounds of nature when I could and there were even times when I just enjoyed the silence, but there were certainly some long monotonous sections where I was very glad of my iPod. I have quite an eclectic taste in music mostly dominated by rock, indie and Americana. My playlist is quite varied and includes the likes of older stuff like the Rolling Stones and Bruce Springsteen and newer artists like The Charlatans and Dawes. I like to mix things up a bit and therefore tend to listen on shuffle mode rather than stick with one album or artist. I like the surprise of not knowing what song is coming up next. It was surprising how often the song would just suit the section of the walk perfectly, like Walking on Sunshine by Katrina and the Waves when walking on a gloriously sunny day in the Sperrins or Echo Beach by Martha and the Muffins as I headed out across East Strand from Portrush! Do you have any information or advice you think would be important to someone thinking of walking the Ulster Way? Be properly prepared, both in terms of knowledge and equipment. Most people are probably quite familiar with seeing Ulster Way signs when they drive around various parts of Northern Ireland, but this is only the more accessible parts of the route that are on show. What most people perhaps don't realise is that the Ulster Way brings you over lots of very remote and challenging terrain and there are many sections where you will not see another single person for miles on end. It is also important to read the route descriptions on the WalkNI website very carefully in conjunction with the maps - sometimes one sentence on the page or an inch on the map can take an hour or more to cover on the ground! Invest in a good pair of comfortable, waterproof boots and/or walking shoes - it's your feet that you are going to be depending on more than anything else to get you round so look after them! Will you keep walking or are the feet happy enjoying a well-deserved rest? A well-deserved rest for now but I would certainly like to keep walking in the future and I don’t think it will be too long before I start planning my next adventure. There are certainly plenty of options in Northern Ireland and there are even some places on the Ulster Way that I wouldn't mind returning to in better weather. For example, I took the route round the lower slopes of Slieve Gullion during my challenge due to low cloud on the day. I would love to return on a better day to take the route over the summit - apparently the views are superb on a clear day! Although I undertook my challenge for a very particular reason, my trek round the Ulster Way has certainly given me a much better appreciation of the varied beauty of little country that we live in and my advice to anyone reading this is to get out there and explore it. If you would like to support Dermot in his fundraising efforts for Cancer Research UK you can do so via his Just Giving Page. You can also read about his journey in more detail via his blog posts and view hundreds more photos taken along the route on the 1000K4J Facebook Page. 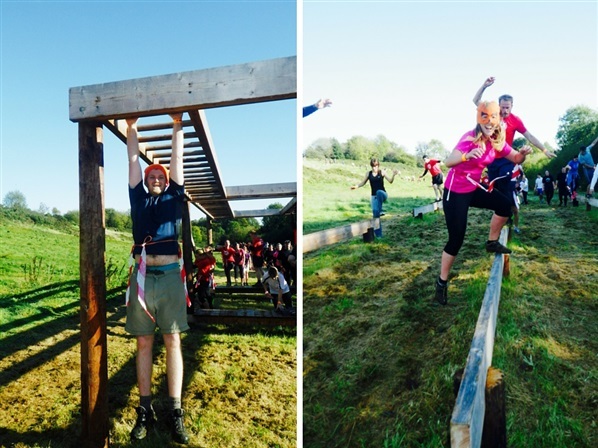 Imagine being chased through fields, rivers and mud over fences and through graveyards by flesh eating zombies…no I’m not describing your worst nightmare but the Jungle NI’s unique and daring 5K Charity Obstacle Run. With three lives to protect runners must make it to the finish line with as many lives as possible intact all whilst negotiating a range of obstacles along the way. Having never ran the length of myself never mind 5k the incentive of being chased by zombies seemed like the only plausible way I could complete my first ever run. With that in mind it was this time last year that I somehow found myself standing at the start line with a mix of terror, excitement and adrenaline pumping through me. I was always under the impression that I couldn’t run if my life depended on it so you could say this was to be the ultimate test! If there was ever a time to whip out and wear pumpkin balaclavas this was it! So along with two of my colleagues we headed to the Jungle NI in Moneymore, Co. Derry~Londonderry on an uncharacteristically sunny Sunday morning last October. The operations on the day were slick from start to finish with no mad queues at registration and plenty of water and treat filled goody bags handed out. As we got prepared and chilled out in the onsite purpose built barn and coffee shop I noticed there was a varied mix of people waiting to take part from competitive crossfit teams to charity runners and those there just to have a bit of a laugh which put first time runners like me at ease. It wasn’t long before we were gathered together in a grassy field for a quick safety briefing before the living dead (soon to turn against us!) lead an energetic warm up to zombie themed music that would have made even Mr. Motivator jealous and added to the fun atmosphere of the event. A number of star jumps and burpees later we were set of in heats to avoid funnel necks at the obstacles. As we set off the adrenalin was really pumping as not only did we not know what to expect but we didn’t know where or when the zombies would be lurking. The start of the course went through a field where everyone jogged, ran or walked depending on if they wanted to preserve their energy / how fit they were. After a quick dip in a muddy river the precedence of the course was set – if you don’t like getting your trainers dirty then this is definitely not the run for you! After this the obstacles kept coming as we attempted to scale fences using the only male in our team as a human ladder before leaving him to fend for himself as we reached the other side. Next came the balance beams (where I found out mine was non-existent) and monkey bars - surprisingly a lot harder when you’re not 5 and have your dad to hold you up. In a cruel twist of events as we ran up and down rolling hills zombies were waiting for us at the top just as energy reserves were running low so it was a case of tactile ducking and diving or my particular favourite defence mechanism of using the person in front as a human shield. The pace soon slowed down as we made our way through the muddy forest nervous to speed ahead in case something was lurking round the next tree. It was at this point that my selfish survival instinct really kicked in as I pushed my team mates ahead of me. A connoisseur of terror the Jungle NI is transformed every Halloween for their popular Fight Night event so the props littered across the site from its hill top graveyard where zombies lurked behind tombstones to cornfield scarecrows really added an extra edge to the event. Half way through the course it wasn’t long until the inevitable happened and I lost all my lives confirming the fact that I would most likely not survive a zombie apocalypse. Determined to keep going (I literally had nothing else to lose!) I decided to finally take one for the team and act as a zombie distraction for my other team mates who still had lives left. The authenticity of the zombies really made the event; not only was the makeup and clothing fantastic but the commitment of the actors definitely didn’t go unnoticed, some of which were definitely worthy of being cast in Dawn of the Dead. 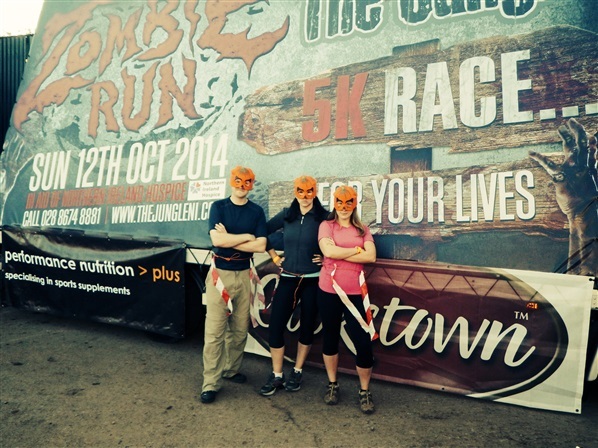 We even met one post-race who due to his enthusiasm had pulled a muscle from contorting his body all day! The course came to a climax with a field swarming with zombies determined to take whatever lives were left. 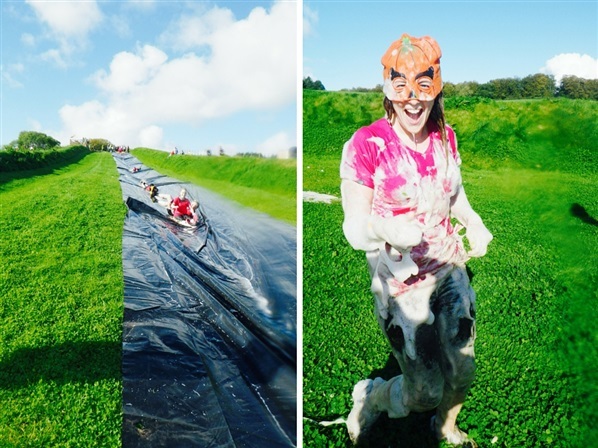 We made it through to find that the best had most definitely been saved to the last with a giant slip and slide down the zorbing hill. I couldn’t have had a bigger smile on my face as I went down the water chute that could rival most waterparks with plenty of fairy liquid and water ensuring a fast flow. After this it was the home straight to collect our blood dripping badass medals before chowing down guilt free on a giant hotdog with all the trimmings at the free of charge BBQ. A fantastic way to end a fantastic morning. 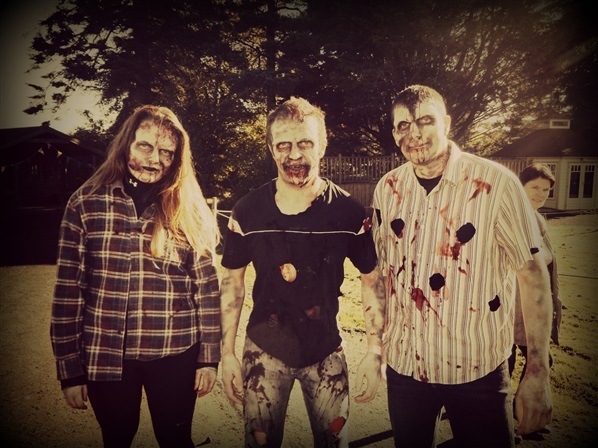 With the local radio station on-site pumping the tunes and the sun still shining the atmosphere at the end was buzzing as we recounted our favourite bits, most epic falls and scariest zombies. Entry for this year’s event on Sunday 11th October is now open with booking available online at www.TheJungleNI.com. The event costs £25 to enter with a donation from all entry fees going to Autism NI. We DARE you to sign up! Colourful scenery, misty mornings and golden sunsets – autumn is definitely the season to be pulling on the walking boots. To make the most of this fabulous time of year we have teamed up with walker friendly accommodation to provide some great walking break offers in the best walking locations throughout Northern Ireland. Valid from Sept - Nov (T&Cs apply visit WalkNI for more details) all you have to do is contact the accommodation providers directly and quote ‘WalkNI’ to book. This fantastic 7 mile circular walking route follows the Mourne Wall to the summit of Slieve Binnian (747m), traverses between the impressive South and North Tors with spectacular views of both Silent Valley and Ben Crom Reservoirs before descending along a track past the Blue Lough to Annalong Forest. A cluster of 5 luxury, 4 star self-catering cottages nestled against the magnificent back drop of the Mourne Mountains, in a rural picturesque area close to the bustling seaside town of Newcastle and walking distance to Binnian. An alternative to the popular Donard Forest route, the impressive Bloody Bridge River will guide you past the old quarry - a great vantage point for the line of a disused railway leading to Carr’s Face on the slopes of Chimney Rock Mountain before following the famous Mourne Wall to Northern Ireland’s highest summit. Nestled between the Mourne Mountains and the glimmering Irish Sea this 4 * Country Club & Hotel prides itself on their warm, friendly atmosphere and the high quality of food. This deluxe 4* hotel with spa is the perfect place to unwind after conquering some of the highest peaks. A golden strand of beach borders one side with the majestic Mourne Mountains providing a welcoming vista from the hotel. A strenuous walk this route takes in the peaks of Slieve Bearnagh (one of the most distinctive mountains in the Mournes, renowned for the granite tors on its summit (739m)) and Slieve Meelmore (704m), finishing by walking down Happy Valley and along a section of the Ulster Way. This circuit uses the Mourne Wall as a handrail on the higher parts of the mountain and offers superb views on a clear day stretching as far as the Sperrins, Lough Neagh and Strangford Lough. 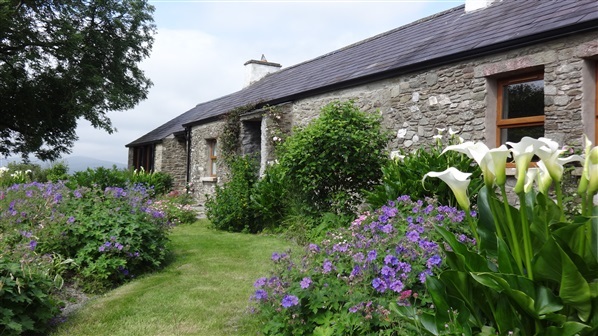 Gorse Hill Farm is a beautiful 4 star self-catering cottage set in the heart of the Mourne mountains with unsurpassed views of Shimna valley, Meelmore and Hare’s Gap (the most dramatic mountain pass in the Mournes). This coupled with secure storage, free parking washing machine and free Wi-Fi makes it a walkers haven. This mountain ramble follows the Banns Road in the Mournes and circles Lough Shannagh (the largest natural body of water in the Mournes), reaching a high point of 587m at Carn Mountain. Lough Shannagh (the lake of the fox) is an impressive view in itself however if you are looking to add in more height nearby Doan Mt provides stunning panoramic views form a height. Walkers are sure to be warmly welcomed at the Mourne Lodge in Attical based in tranquil surroundings between Silent Valley and Spelga Dam. This budget guest accommodation is perfect for walkers providing delicious home cooked meals as well as self catering options. 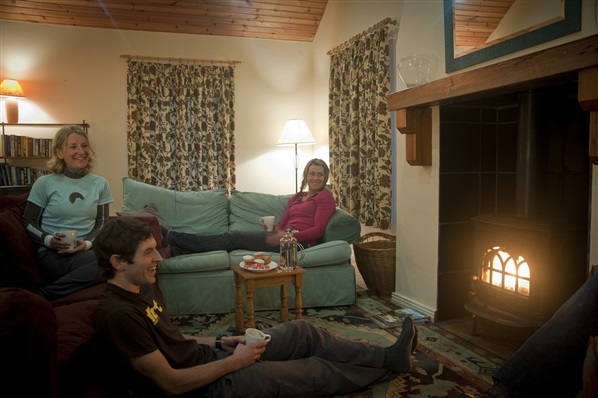 Relax with your walking group or curl up with a good book beside the wood burning stove in the spacious shared lounge. From breath-taking views to the Mourne Mountains as well as some of the oldest and rarest existing trees in the British Isles the 7.5 mile network of walk trails in Castlewellan Forest Park will not disappoint. The Slievenaslat Trail provides a series of stunning viewpoints offering panoramic views of the Mourne Mountains whilst the Annesley Garden Walk takes in a variety of Lakes and Ponds within the forest opening up a treasure trove of plants, trees and secluded spots in this real life ‘secret garden’. Other walks include a leisurely stroll around Castlewellan Lake as well as the Cypress Pond Walk and Moorish Tower. With uninterrupted views of the Mourne Mountains and Tollymore Forest just 1.5 miles from Castlewellan this 3 bedroom self catering accommodation provides a brilliant escape to the Mournes for a true taste of country living whilst still located within easy access to both Castlewellan and Newcastle. Visit WalkNI.com for even more walker friendly accommodation offers in the Mournes and throughout Northern Ireland. In Part 1 of the Todd’s Leap Adventure Blog series we headed to Todds leap in search of the ultimate day out...With a morning packed full of activities including clay pigeon shooting, the giant swing and drop zone we couldn’t possibly pack it all into one blog! Having enjoyed a delicious lunch in Todds Leap’s Twisted Axle Bar & Restaurant we were fuelled for what was set to be a fantastic afternoon of even more adrenaline packed activities. With a recent extension to the off road course, even if you have done this activity before there are lots of new challenges you must come back and have a go at! Specially adapted these 4x4’s allow those with no driving experience and even children (yes even children!) to have a go behind the wheel making this an activity the whole family can have a go at! Climbing out of our Land Rovers we walked over to the large shipping container at the edge of the yard where we were kitted out with a harness and belay and loaded into the back of their ‘Zip Rover’, for what we were told was one of Todds Leap most popular activities with adventure seeking visitors. The journey to the Zip Tower at the highest part of the off road track was an experience all by itself, as we held on tight over the rocky terrain we had previously driven down behind the wheel of our Land Rovers. At its peak, the zip line hangs 50 metres above the ground and is a staggering 500m long making it Ireland’s longest zip line. From here you really do get to see the epic scale of Todd’s Leap Activity Centre! Soon we were knee trembling our way up the four flights of stairs to the top of the tower where our instructor clipped us onto the wire and guided us as we launched ourselves out over the valley high above the off road course, sailing through the skies over the impressive forest below and praying gravity would help us stop at the end. Nothing could have prepared us for our final activity of the day! We had heard rumours that the Hill Rally Stage was not an activity for the faint hearted…but a must do activity for all thrill seekers! It would be fair to say that we each were experiencing a wide range of feelings from ‘nervous wreck’ to ‘bring it on adrenaline junkie’ as we harnessed up into the back of our specially prepared Rally Land Rover and listened intently to the safety briefing from our driver. The engine roared and before we knew it we had taken off down the off road track reaching speeds of 70mph on parts of the course we had taken on earlier in the day in 1st and 2nd gear, in what now seemed like a snail’s pace! The air quickly filled with the sound of laughter and screams as we flew round corners, bounced over rough terrain and splashed through rivers. Words cannot adequately describe or do justice to this activity and the emotions stirred up. We definitely finished our day on an adrenaline high like no other!! After a group photo we were on our way back to Belfast already planning our next visit. However, we would love to have stayed the night in the quirky onsite accommodation which takes Glamping (glamourous camping) to a whole new level. These muti coloured shipping containers have been converted to include bunk beds, ensuite bathrooms and lots of other home comforts. Check out the latest video for a flavour of what you can expect on your next adventure to Todds Leap. We've teamed up with over 30 accommodation providers to offer bespoke discounts on a range of MTB-Friendly places to stay across Northern Ireland this Autumn. Valid from Sept - Nov (subject to availability) we've picked out just a few of our favourite offers below. 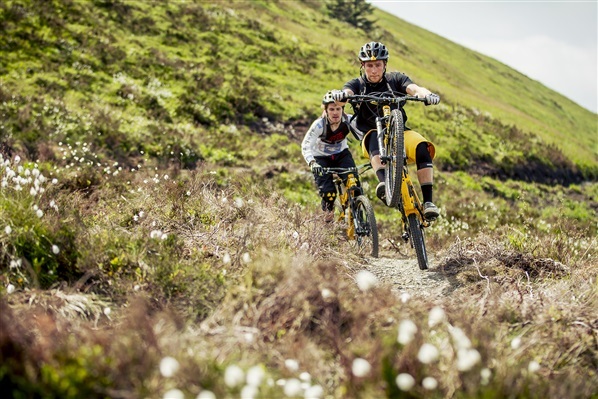 Only a short cycle from the Rostrevor Mountain Bike Trails, Rostrevor village is quintessentially Northern Irish with traditional pubs, cosy cafes and welcoming accommodation options. 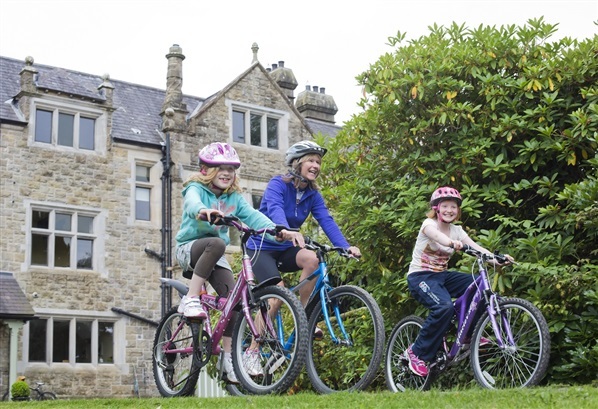 One of Rostrevor's most popular B&Bs with a whole host of mountain biker friendly facilities. 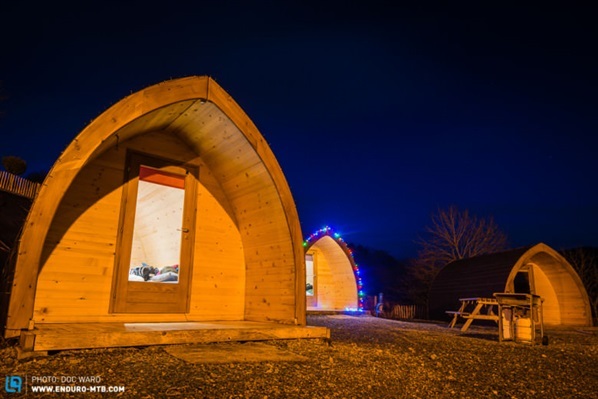 Budget-friendly 'glamping' with a shuttle service to/from the Rostrevor Trails. Situated in the heart of Rostrevor Village, Kilbroney Court sleeps up to 8 people and is perfect for groups. 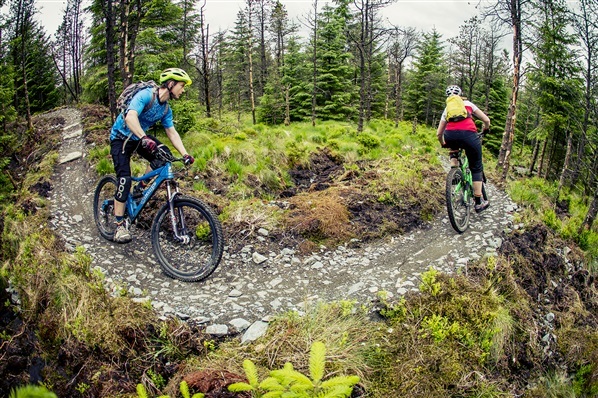 Just minutes from the Castlewellan Mountain Bike Trails this welcoming town offers a wealth of MTB-Friendly accommodation providers and is an ideal base for mountain biking trips to Northern Ireland. 9 bedroom Guest Inn located at the entrance to Castlewellan Forest Park. Can't stay much closer than this! 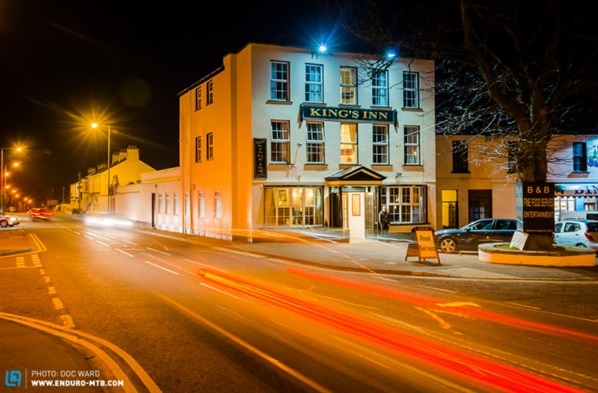 Situated in the heart of Castlewellan, this family run Inn boasts its own traditional Irish pub. Self-catering accommodation with secure bike storage and panoramic views of the Mournes. The Davagh Forest Trails are tucked away in the untouched Sperrin Mountains. If you're looking to get away from it all then this is where you'll want to head! Located close to Davagh Forest, this is a great spot to pitch your tent and enjoy a few post-trails pints! Stay in a cosy 200 year old cottage in the heart of the Sperrin Mountains. Renovated rural cottage in the Sperrins with loads of MTB-Friendly facilities. 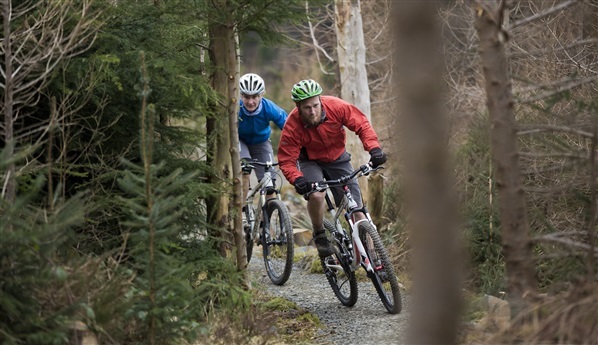 The family-friendly Blessingbourne Trails near Fivemiletown offer a range of blue and red grade mountain biking trails with on-site accommodation. Fancy having the trails literally on your doorstep? Then these luxury apartments are for you!